After a year of tragedies, framed by the deaths of Eric Garner and Kalief Browder, it’s time for our leaders to discard this racist and immoral idea. Nearly a year ago, Eric Garner’s death on Staten Island while being arrested for selling loose cigarettes illustrated just how easily things get out of control with “broken windows” policing. It prompted a nationwide reexamination of the illogical premise that cops can best combat violent crime by racking up busts on petty offenses like littering, jaywalking, or playing music too loudly. Garner’s death was the first in a disturbingly long string of police killings of unarmed black men and children over the past 12 months. These outrages have radicalized what ought to be a self-evident statement that black lives matter. And yet, despite this scrutiny, the philosophy of “broken windows” policing still retains credibility with the mayors, councils, and police chiefs of most major American cities. If anything can shatter that consensus, it should be the suicide of 22-year-old Kalief Browder in the Bronx. Four years ago, Browder was arrested for stealing a backpack. Unable to make a $10,000 bail, he was held in Rikers for three years without trial; the charges were ultimately dropped. As The New Yorker reported, Browder was locked in solitary for two years and subjected to constant abuse. His family and lawyer say the ordeal scarred him permanently. He attempted suicide once while in jail, another time shortly after his release. On June 6, he succeeded in hanging himself. His mother discovered his body when she stepped into her backyard and looked up. Browder’s tragic story points to the most damning indictment of “broken windows” policing. It’s not just that it escalates so easily to fatal violence; it’s that “broken windows” corrodes every aspect of criminal justice—and destroys the lives of untold numbers of people it doesn’t manage to kill. Roughly 90 percent of those arrested for misdemeanors in New York City are people of color. Even before Browder’s death, his story helped prod reforms at Rikers. Mayor Bill de Blasio announced in April a plan to clear the facility’s backlog of unnecessarily incarcerated people. But while moving people through Rikers more quickly is crucial, the real problem is the number of people put there in the first place. From New York City to suburban McKinney, Texas, we are past the point of mere procedural reform. We saw yet again in McKinney how the implicit bias that cops carry into unnecessary encounters with black people easily escalates to violence. As Officer Eric Casebolt shoved his knees into 15-year-old Dajerria Becton’s back, he wildly waved his gun at her teenage friends—all armed with nothing more than bathing suits and towels and guilty of nothing more than holding a boisterous pool party in a white neighborhood. The encounter could just as well have ended in one of the teens’ deaths as it did in Casebolt’s resignation. Yes, body cameras, inspector generals, and better training may help change the tenor of policing. And in New York City, the gradual decriminalization of marijuana possession and the diminished use of stop-and-frisk are having an impact. But after a year of public scrutiny over policing’s excess in black neighborhoods, what’s required now is a more fundamental break with the past. 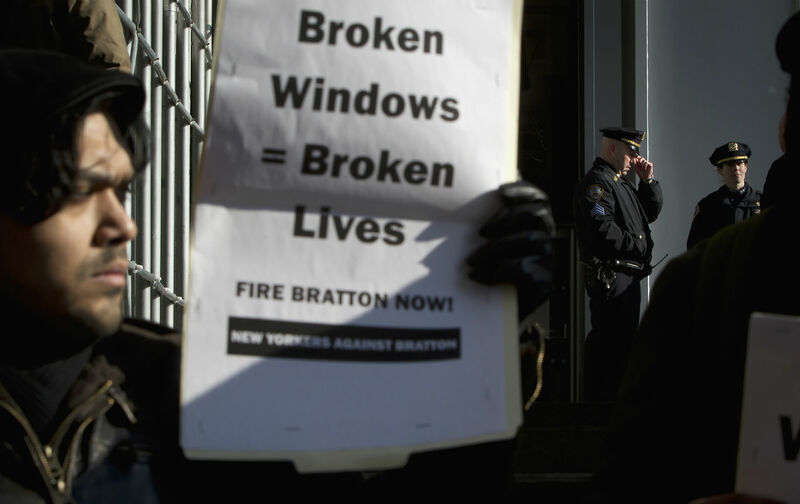 Instead, the most prominent defender of “broken windows,” NYPD Chief Bill Bratton, has descended into absurdity. Recently, he complained that he can’t hire more blacks as cops because “so many of them have spent time in jail.” At the same time, he steadfastly defended the very policy that created this inequity. This circular logic cannot be squared by incremental reform. The politics will be tough, but it is time our leaders acknowledge “broken windows” as an immoral, ineffective, and racist idea—and toss it into the dustbin of history.